Diwan-I-Am (Hall of Public audience)was again a building constructed by Shahjahan who replaced an earlier wooden structure. The arches are covered with white lime polished to a smooth finish. The triple arched royal canopy has lavish pietra dura ornamentation. Here was kept the famous Peacock Throne ordered by Shahjahan. 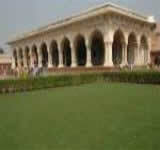 He met officials and commoners and listened to the petitioners in the Diwan-I-Am.